After months of late night work I’m thrilled to announce Teüna, my first iOS app. 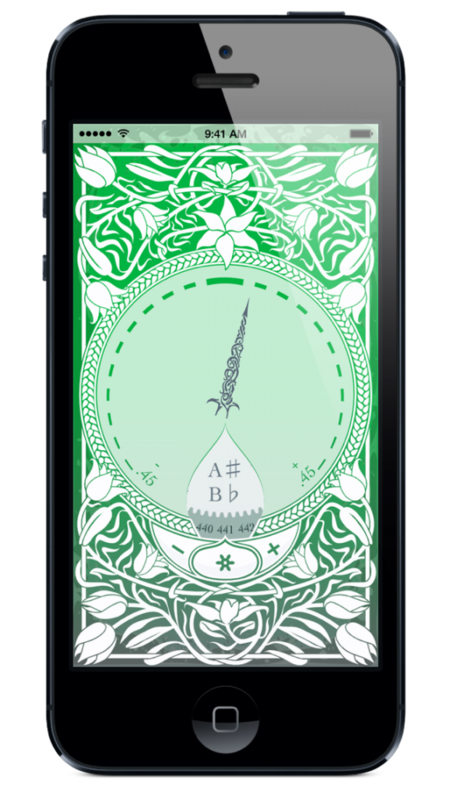 Teüna is a chromatic tuner, for tuning any musical instrument or voice. It’s useful for tuning the instrument right out of the case or for setting on your music stand to give you visual feedback on your intonation while you practice or play. Inspired by the pocket watches of the 17th century, this is a tuner Bach or Mozart wouldn’t mind carrying. I’ve sought elegance and the feel of beautiful live tones–the colored background responds to tones instantly. Almost every tuner I’ve ever used are more accurate than my ears, but they often fail to “hear” quiet tones and especially low tones. As a 5-string bass player I have a vested interest in tuning the low notes (which are also hardest for me to tune by ear), and I think Teüna succeeds for them. It’s the best microphone-based bass tuner I’ve ever tried at least. Detecting pitch quickly is obviously important, and Teüna does it well. But I still use an iPhone 4 and we have a first generation iPad. These older devices can still be useful, but not if you want to throw them across the room before they finish loading your app. Even with its beautiful graphics, Teüna’s launch time is competitive compared to other apps. Teüna is available on the App Store now. I’m planning to write more about developing it. Look around, join my mailing list or subscribe to this blog or Twitter for announcements, and let’s stay in touch, okay? This entry was tagged announcements, release, Teüna. Bookmark the permalink.